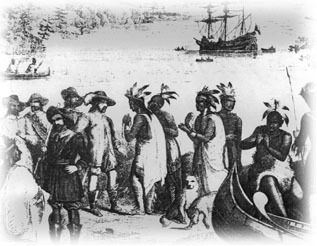 The people that lived on the New Jersey side of the harbor at this time were called the Lenape. In this area, the Lenape lived in villages along the shore where they could take advantage of the animal and plant resources available in the estuary located at the mouth of the Hudson River. At this time, most of the area presently encompassed by Liberty State Park was a shallow body of water known as Communipaw Cove. The Dutch were the first European settlers in the area, arriving between 1610 and 1633. The early Dutch established trade with the natives. They also found this area offered plenty of natural resources, land for farming, and easy transportation using the harbor and rivers (the Dutch established the first ferry between the area and New York City in 1661). By the end of the seventeenth century, the British had taken control of the region from the Dutch. 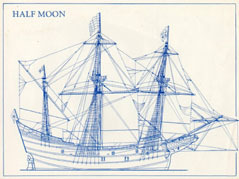 The British allowed the Dutch settlers to remain; the number of colonists slowly grew throughout the late seventeenth and the eighteenth centuries. As roads and ferries developed, the areas of Communipaw (a small village in the area of the park) and Bergen (the original Dutch village now known as Jersey City) became stopping points on the route between the growing town at the southern tip of Manhattan and the settlements further west. The area remained much the same into the Revolutionary War. During the war, fortifications were built at Paulus Hook (near the northeastern edge of the park today) by the Americans. This location offered a natural location for firing on ships using the harbor. The British bombarded the fortifications on July 12, 1776 and attacked again on September 15th. The Americans abandoned the fort and the British took over, strengthening the fortifications between 1776 and 1780. The British held the location until 1783 when, at the end of the war, they evacuated the New York Harbor.